I have lost count of how many chocolate cakes i have made but this one is a keeper! Probably one of the best recipes I have found because it is so easy. 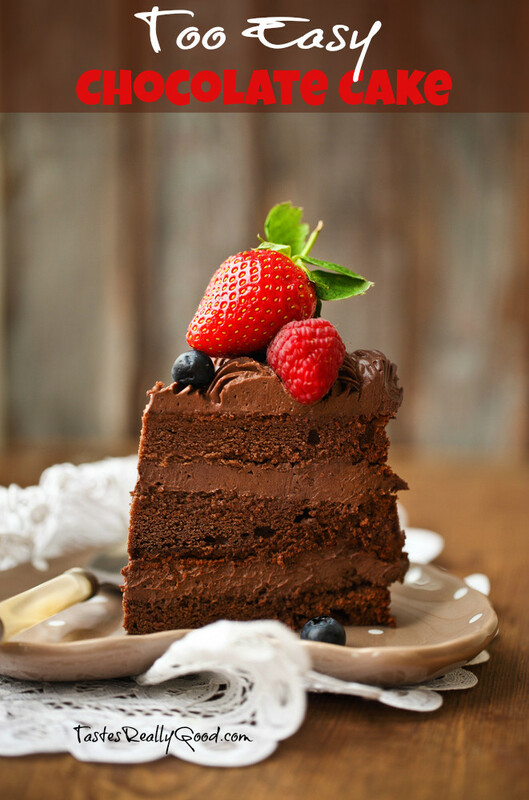 The results speak for themselves and this chocolate cake is really moist, smells delightful and has a great rich chocolatey flavor. As it is really moist you ‘may’ have troubles constructing the cake so to remedy this just place the cooled layers in the fridge for 15 to 20 minutes before you fill and frost the cake. This will make putting it together a breeze. Your search for the perfect chocolate cake is over folks. Preheat the oven to 350F. Grease and line two 8 inch sandwich tins. For the chocolate icing, heat the chocolate and cream in a saucepan over a low heat until the chocolate melts. Remove the pan from the heat and whisk the mixture until smooth, glossy and thickened. Set aside to cool for 1-2 hours, or until thick enough to spread over the cake.